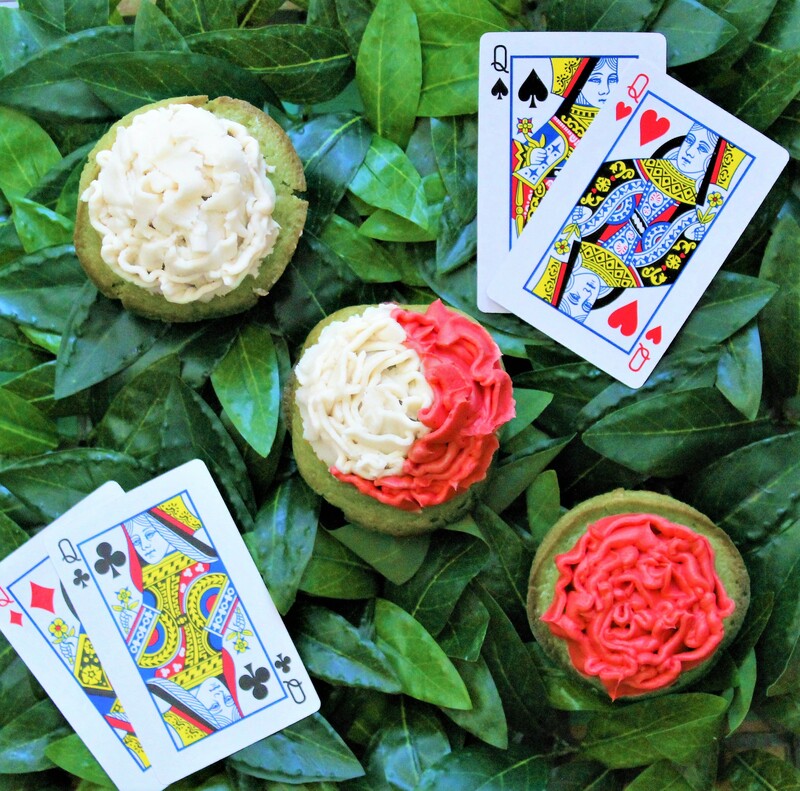 With the 66th anniversary of Disney’s Alice in Wonderland approaching, and to also play along with Disney Family’s #DisneyWeekend theme of Alice in Wonderland, I made Painting the Roses Red cupcakes! They are simple and healthy matcha green tea cupcakes, topped with low-sugar white and red frosting. I love these cupcakes, since they are sweetened naturally with matcha and a little maple syrup, so they are not overly sweet. Mix together your coconut oil, eggs, maple syrup, applesauce, milk, and vanilla with an electric beater. Add in your flour, salt, and matcha and beat again until combined. Spray a one dozen cupcake tin with coconut oil cooking spray, or use paper liners. Pour your batter to the top of each hole and place in the oven for 20 minutes. Divide a container of your frosting into two small bowls. In one of the bowls, add about 6 drops of natural red food dye (there are several brands available of natural dyes at big grocery retailers). Combine until color is completely mixed. Fill a piping bag with the white frosting and top however many cupcakes you like with white (I did four with white). Then top an additional four only halfway with white. Next, fill your piping bag with red frosting, and complete the cupcakes that you only frosted halfway with white, for a half white/half red look. Finish decorating the rest of your cupcakes with just red frosting.